not address the primary source of any impacts and also prevents the tribes from implementing their treaty-reserved rights." After lower Columbia tribes complained about the timing and possible policy implications of a review of the draft F&W program by the Independent Scientific Advisory Board, the panel that oversees its work agreed with them, and decided June 20 to pull the plug on the effort. The Northwest Power and Conservation Council had asked for the ISAB review as part of its process to complete the latest revision of the F&W program, and requested ISAB Administrative Oversight Panel concurrence from NOAA Fisheries and the Tribes. The panel is made up of NPCC Chair Bill Bradbury, Paul Lumley, executive director of the Columbia River Inter-Tribal Fish Commission, and John Stein, NMFS science director of the agency's Northwest Fisheries Science Center in Seattle. The panel has decided to begin exploring an alternative review, said Erik Merrill, manager of the Council's independent science program by email. Merrill said the new review might focus on key salmon recovery issues and examine a broader scope of plans that could include not only the amended F&W program, but also the updated Wy-Kan-Ush-Mi Wa-Kish-Wit tribal salmon restoration plan, and maybe NOAA Fisheries' Columbia Basin Long-Term Recovery Situation Assessment. At issue are long-standing differences between the ISAB and the tribes over scientific evidence supporting the value of supplementation. 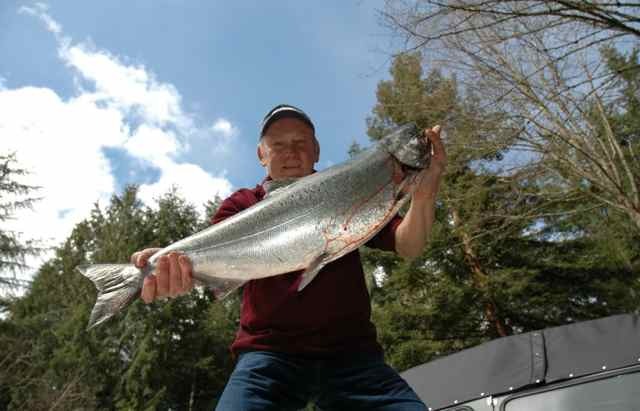 The ISAB still considers supplementation an experimental action, while the tribes point to places like the lower Snake, where hatchery fish have helped boost wild fall Chinook returns from 78 fish in 1990 to 20,000 last year. The new draft program says the Council considers supplementation as an experiment, and calls on BPA "to require that hypotheses and assumptions be provided for all such programs and reported on annually." BPA spends about $78 million a year on hatchery programs. The Columbia River Inter-Tribal Fish Commission says language in the draft F&W program needs to be changed, particularly a section that calls for implementing recommendations from the Hatchery Scientific Review Group, whose 2009 report called for dialing back the number of hatchery fish on spawning grounds, in many situations, out of concern for the future fitness of the wild runs. The new program language also states that "NOAA Fisheries and any entity implementing or regulating an integrated production program shall incorporate into any HGMP [Hatchery Genetic Management Plan] and other operational or management plans the principles and guidelines from the HSRG's final recommendations unless there is a compelling reason not to do so. NOAA Fisheries and the agencies and tribes shall report annually to the Council on the number of HGMPs approved, describe the extent to which HSRG recommendations are being integrated into HGMPs and other production plans, and explain any reasons for not incorporating the HSRG recommendations. Final HGMPs and other production plans shall also be consistent with tribal treaty and trust obligations and other legal requirements." But CRITFC policy development/litigation support manager Rob Lothrop said the tribes are not overreacting, the HSRG language in the draft F&W program is simply too prescriptive. Steve Parker, technical services director for the Yakama Nation Fisheries, was more blunt. "These proposed measures mean they [the Council] don't understand the consequences of them." Parker said the draft language may not have been intended to be so prescriptive, but it must be changed. CRITFC is working on comments to the draft F&W program that call for a much simpler version of these issues, "much less prescriptive," and that note the "tremendous success" of supplementation efforts with lower Snake fall Chinook, upper Yakima spring Chinook, and Wenatchee coho. The tribes are also concerned that if the draft recommendations make it into the final F&W program, potential restrictions on hatchery operations might occur, since the program is used to guide other federal agencies' actions. They also said it could impact litigation by conservation groups, who could cite the HSRG recommendations in their attempt to curb some hatchery practices. Parker said the HSRG goals weren't meant to be applied right now, but were expected to be phased in over decades. "The [Council] staffers don't know what they are doing," he said. But CRITFC voiced its opposition to including the HSRG recommendations at that time, and even called for deleting language in the 2009 program that said the Council "will consider" adopting the HSRG recommendations, and adding a paragraph that said the Council will "ensure that artificial production strategies are consistent with U.S. v Oregon management agreements, the Pacific Salmon Treaty, tribal trust and treaty rights, and recovery plans and that they do not discriminate against tribal programs if it decides to incorporate HSRG recommendations into the Program." Lately, tribal spokespersons have been taking their message public. CRITFC executive director Paul Lumley told the Yakima Herald-Republic that the Snake would not have 20,000 wild fish coming back each year "if we didn't have hatchery fish on the spawning grounds." When the HSRG review came out in 2009, it noted that 77 percent of the fall Chinook spawning in the lower Snake were of hatchery origin, more than twice the proportion it had recommended for such integrated programs. Last year, about 73 percent of the fall Chinook adults on the lower Snake were hatchery fish. The HSRG said the lower Snake hatchery program provided some conservation benefit to the natural population, but the group was "unable to develop a solution that achieved the standards of either a Primary or Contributing population under the existing conditions." At the time, comments from hatchery operators on the HSRG review reminded the region that some of the recommendations, especially those that called for reducing hatchery returns on wild spawning grounds, conflicted with mandated production goals developed through the U.S. v. Oregon process and the U.S./Canada salmon treaty. In its comments last fall to the Council, CRITFC also voiced opposition to mass marking of hatchery fish and mark-selective fisheries programs until there is "a well-documented Columbia River salmon scientific conclusion that these programs do not harm salmon populations and tribal fisheries." The tribes also said new information "suggested confounding variables and alternate explanations for the study results used by the HSRG in its models of population responses to PNI [proportion of naturally spawning adults] management." They said the measurable benefits of modern hatchery methods should be given greater consideration than the "hypothetical risks" of hatchery effects, "unless empirical evidence demonstrates that hatchery effects have adverse significance to natural populations. The HSRG guidelines may provide a starting point for the discussion of hatchery strategies, but they are not an appropriate constraint on the eventual decisions for individual programs. Hatchery strategies and practices should be shaped to meet local needs." CRITFC said the ISAB recommendations about the risks of hatchery programs were not quantified, and were not made in the context of risks across the salmon's life-cycle, and were too broad to be applied to every situation. "If the Council limits or reduces the artificial production program funded under the Fish and Wildlife Program, it does not address the primary source of any impacts and also prevents the tribes from implementing their treaty-reserved rights." The CRITFC tribes also recommended language that called for the Council to consider adoption of the Hatchery Genetic Management Plans approved by NOAA Fisheries that spell out acceptable impacts to ESA-listed wild stocks. The tribes had also suggested deleting any HSRG recommendations regarding changes in harvest practices. The original 2009 report called for more marking all hatchery fish and more selective harvest of them, as part of its overall plan to improve wild spawning numbers. Council staffers were still reeling from the tribal response early this week, explaining that nothing in the draft program is aimed at reducing any tribal hatchery program currently funded by BPA. Meanwhile, the Council has extended the public comment period on the draft F&W program another two weeks, until July 25. After that, staff will be packaging comments to send to Council members before the last round of changes is completed and a final document is released.